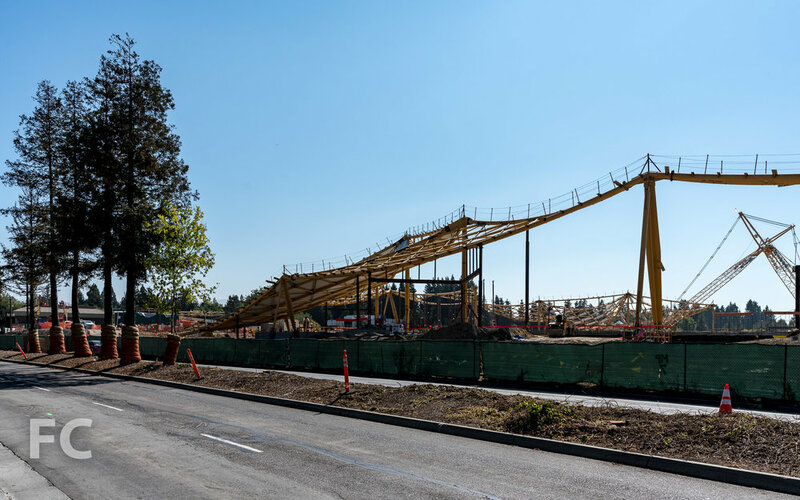 Construction is underway on Google’s Charleston East campus expansion next to the original Googleplex campus in Sunnyvale, California. Designed by Bjarke Ingels Group (BIG) and Thomas Heatherwick, the 645,000 square foot campus features a hangar like canopy that allows for flexibility in locating walls and floor below. According to BIG, their strategy for the building was to “create a replicable and scalable building typology that is also adaptable and inclusive” to Google’s other potential expansion sites nearby. At the canopy, smile shaped clerestories allow for sunlight to reach the main work spaces of the second floor’s interconnected floor plate. Secondary program and public spaces occupy the ground floor and connect to the second floor by courtyards. Architects: Bjarke Ingels Group (BIG) with Thomas Heatherwick; Client: Alphabet; Program: Office; Location: Sunnyvale, CA; Completion: 2019.